I was introduced to this heavenly concoction by my mother when we were kids. She would suddenly announce one evening that she was making Chocolate fudge and my brother, Prasan and I (we were only two brothers at that time, the monster was born later) would wait eagerly till my mother would patiently mix the ingredients, cook them and then roll the resultant mixture into eclair-shaped balls which we would gobble up in sheer delight! For those who aren't familiar with the Chocolate Fudge (are there any? ), it is a chocolate based dessert made out of milk, sugar and nuts. I have had fudge made by different people in different styles. Some people make it smooth and dry. Some people make it coarse and wet. I like the coarse and wet version. The best chocolate fudge I have ever had is the Chocolate Walnut Fudge from Cooper's in Lonavla, a hill station in Maharashtra, probably a three-hour drive from Mumbai. I was at my aunt's house in Mumbai, one summer, many years back. Some relatives were driving down to Mumbai from down south. They had to cross Lonavla and on the way, picked up a whole lot of Chocolate Walnut Fudge from Cooper's. They had been fans of this fudge for a long time. I was tasting it for the first time. I took a piece. Gosh! this was heavenly. I was wondering why they had brought so many boxes. Now, I understood. By the end of the day, the entire fudge was devoured by my cousins and me! The only problem was that this place was not close by, by any means. A three hour drive from Mumbai! After a couple of years, I had gone to Mumbai for some work. My uncle loves driving. And I love the fudge. So, both of us conspired and took a couple of others and headed out for Lonavla! We reached Lonavla early afternoon and headed straight to Cooper's near the Lonavla railway station. We were aghast when we saw that the shop was closed! My mind ran amok. Had they shut down forever? Oh, I wished more people knew about this place and the great fudge they made. Then they would have done well and wouldn't have closed down. What a loss for mankind! When shall anyone make such fudge again? A passerby came to mankind's rescue. "Teen baje khulega". ("They will open at 3 p.m."). Thank god, I shouted aloud! The owners, a Parsi family led quite a relaxed life. They opened at 10 in the morning, closed at 12, went home for a siesta and came back at 3 to wind up for the day at 5. It all fell in place. Only these kind of people can make such good stuff. The ones who like the good life. Those who are not in a rat race and trying to outdo everybody. The striking thing about Cooper's is that they only sell from their shop. They have no branches. They do not sell to any agents or salesmen. You wanted Cooper's fudge, you had to go right to their small little store opposite the Lonavla railway station. Lonavla is well-known for chikki. Maganlals makes very good chikki. Trying to ride on the success of Cooper's fudge, they started making fudge too. It isn't half as good. Compare "Maganlal's Chocolate Walnut Fudge" with "Cooper's Chocolate Walnut Fudge". Doesn't even sound as good! The taste, the name of the maker, the place it is located, everything is perfect. 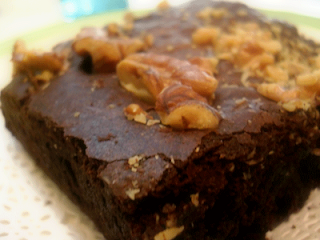 Chocolate Walnut Fudge from Cooper's in Lonavla. Ha, everything about it is perfect! Cooper's is good but then you probably havent tried Nahoum's chocolate fudge or plain butter fudge from Calcutta . I perfectly agree with you. The best thing to happen to me while my Lonavala trip was Coppers. Thanks to your post I found Cooper's. Had eaten their fudge but forgot the name. I've lived in Calcutta all my life .... have tried Nahoums's fudge and am sorry to say its terribly sweet and Cooper's is the best fudge I have eaten so far.